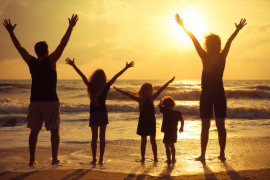 Every parent knows the magic word when it comes to pleasing everyone on the annual family holiday: beach! 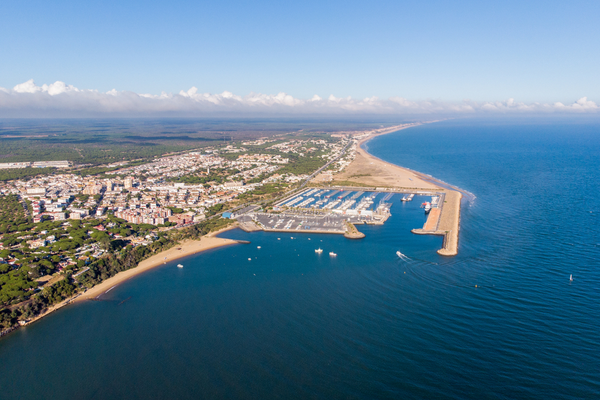 If you’re looking for an all-round magic destination that delivers the best sandy bonanza under the Spanish sun, the beaches that can be found around the beautiful Huelva region have everything the entire brood needs and more. One thing you should understand before you go is that you’re going to be spoilt for choice along this gorgeous stretch of coastline, so it can be all too easy to waste precious time making a decision about where to stay instead of making memories and getting a tan. 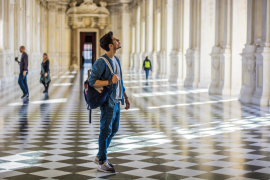 The most sensible idea is to find yourself a comfortable base in the capital of the province (the city of Huelva), pack the sunscreen and get ready for some fun-filled daytrips. 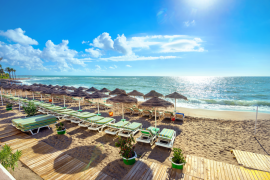 The Huelva province encompasses what’s known as the Costa de la Luz, which is renowned (naturally) for its stunning beaches – many of which are backed by the lush vegetation that defines the area. Some are popular, well facilitated and perfect for children, while others are tranquil, isolated coves where you might not see another soul. 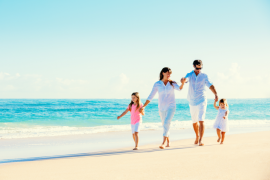 If you’re planning a sun-filled holiday with the family, here are some of the best beaches to consider visiting. Set in a protected location at the mouth of a river near the town of Ayamonte, this is the ideal family beach, with few waves and a coveted Blue Flag status. It’s around a kilometre long, so there’s plenty of room to find your own space. The older kids can try out the range of water sports, while the littler ones can paddle in the shallows and make use of their buckets and spades. 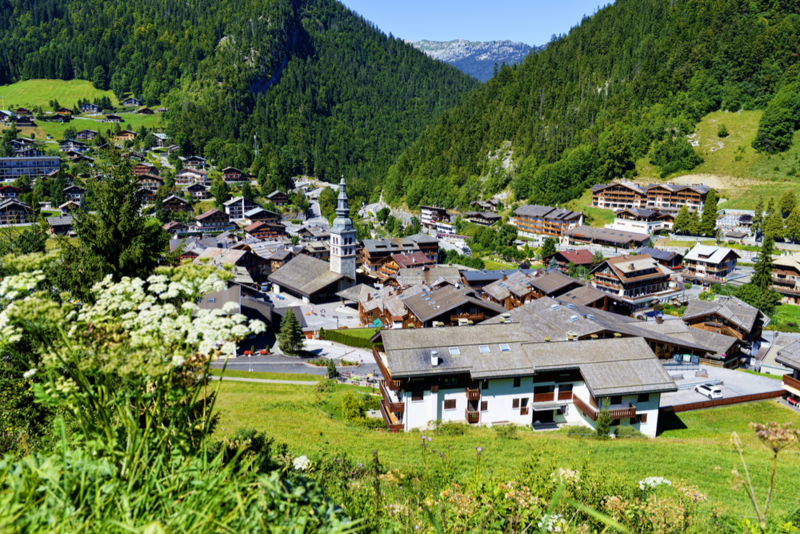 You won’t have to pack a picnic lunch, as the area has plenty of good cafes and bars. You might even want to take the opportunity to explore Ayamonte on a leisurely stroll if you can drag the kids away from the beach. Offering an impressive shoreline near Ayamonte, Isla Canela is five glorious kilometres of golden sand – making it one of the longest in the province. Along with an excellent range of water sports, there are some fantastic facilities including lots of restaurants and accessible wooden footpaths to help young legs explore. Speaking of youngers, one very fun thing to do that the kids will love is to wait until low tide and head out to the massive sand banks. If you’ve got some energetic youngsters in tow, this is the place for you – and the question isn’t what can you do?, it’s more like, what can’t you do? Situated near Almonte, this one also has a Blue Flag status. Along with a huge range of water sports, there are some more unusual activities that will put smiles on little faces, including dromedary routes, visiting the lighthouse and golf. There’s definitely something for every member of the family, that’s for sure! The beach also has direct access to the Doñana National Park, where you can enjoy invigorating hikes or gentle nature walks. For a change of pace, but still with a comforting Blue Flag status, El Parador (in Mazagón) sits in the shadow of soaring cliffs, surrounded by lush views of the Doñana National Park. When the tide is out, a vast expanse of sand is left exposed along the two-kilometre stretch, and it’s one of the most amazing and unspoilt beaches for youngsters to run off their energy for hours on end. If the kids are getting restless, bring them here! 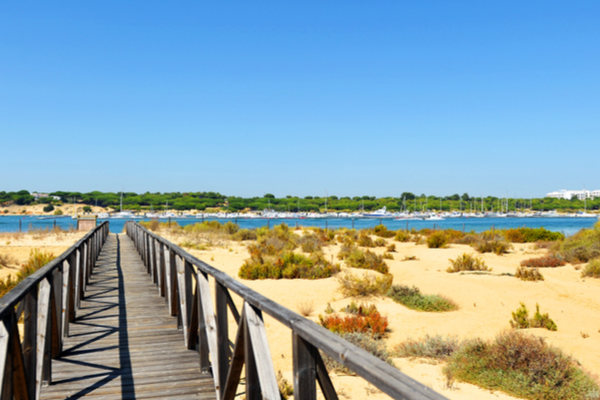 These are just four of many more spectacular beaches that decorate the coastline of the Huelva region. While not all provide suitable conditions for young children, there are so many that do that choice won’t be a problem. Sercotel Familia Conde: This is the ideal family base in Huelva. The Sercotel Familia Conde enjoys a highly convenient location right in the city centre. You’re in a great spot to walk to all the local attractions as well as explore further afield. The clean, comfortable rooms are spacious enough that you won’t get under each other’s feet and the onsite facilities include a fantastic family restaurant and a fitness centre. Periodista Luca de Tena: If you’re looking for a little more independence on your family holiday in Huelva, Periodista Luca de Tena provides stylish and comfortable accommodation complete with kitchen facilities. It’s set in a superb location just a short distance from the centre, and features two spacious bedrooms and a living area – meaning there’s room to move and then some. 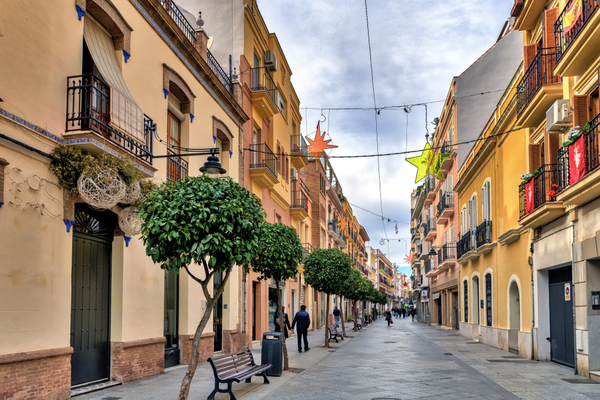 Planning a family escape to Huelva is simple, with a flight time of just over two and a half hours from the UK to Faro Airport. There are multiple airlines from which to choose your flights, including some great budget options. Before you leave home I highly recommend you pre-book an airport transfer with Shuttle Direct to get you from Faro Airport to Huelva. It’s a bit of a hike, with the transfer taking around an hour and a half, which is why I find a private or shared shuttle is the best way to avoid messing around when you’re tied down with kids and luggage. Looking for a completely hassle-free way to get your family and all your luggage from the airport to your accommodation? Shuttle Direct has the answer! All you need to do is make a simple online booking with us before you leave home and choose from one of our cost-effective shared or private transfers. We’re one of the best in the business and we’ve got the reputation to back us up.